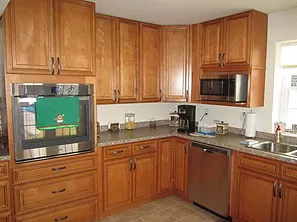 If your cabinets are structurally sound, you are a good candidate for kitchen cabinet refacing. The process entails the removal of existing drawer faces and doors and installation of new ones, while the existing cabinet boxes remain intact and are covered with a thin veneer of plastic, laminate or wood. With the ability to choose hardware of various colors, materials and styles, the possibilities are endless and the results can be dramatic. Hiring experienced professionals, like Desirable Kitchens & Refacing, ensures cabinet refacing is a quick and simple process. Homeowners in Erie, PA, can expect exceptional quality, immediate service and outstanding customer service from our team. Typically, our kitchen refacing projects are completed in 3-5 days, with little to no interruption in utilizing your kitchen. Removal and Disposal – The first step involves the removal of existing cabinet drawer faces and doors, including drawer boxes and glides, if needed. Depending on the items being replaced, we can also remove and dispose of all trim, valences, toekicks and existing countertops. Preparation of Surface – If the cabinets are in good condition and structurally sound, the next step will entail prepping the existing surface for refacing. Desirable Kitchens & Refacing will sand the frames, sides and exposed surfaces back to a clean, original surface. By sanding to their original surface, the new veneers will adhere better to the existing cabinets. Your bare, clean cabinet boxes are ready for transformation. New matching trim moldings, toekicks, valances, etc. We pride ourselves on transforming your kitchen into the kitchen of your dreams– without the mess and the hassles of a full remodeling project that could leave you out of your kitchen for months. If you live in Erie, PA, and are looking to upgrade your kitchen to the fabulous showpiece you always knew it could be, contact us today. Desirable Kitchens & Refacing in Pittsburgh, PA, works with you to find the most cost effective and time efficient way to get the project done. Through our experience and dedication to exceptional customer service, we have the right solution for every customer—every time!